Are Pentecostals mystics? For some the very question seems absurd. While for others it might sound like a great argument for thoroughly rejecting all things Pentecostal. Daniel Castelo, however, makes the argument in his new book, Pentecostalism as a Christian Mystical Tradition (Grand Rapids: Eerdmans, 2017), that this is precisely how Pentecostalism should best be understood. For Castelo, ‘Pentecostalism is best framed as a modern instantiation of the mystical stream of Christianity recognizable throughout history. In other words, Pentecostalism is best understood as a mystical tradition of the church catholic’ (p.xvi). Castelo’s monograph is a highly stimulating and enjoyable academic read. And, as he himself recognises in his Postscript, one which will undoubtedly provoke ‘significant resistance … from a number of quarters and a variety of standpoints’ (p.178). I imagine I would fall into one of those expected quarters of resistance: systematic theology is my subdiscipline, yet he ‘call[s] into question the viability of something called systematic theology.’ And more than that, the very central presupposition on which he bases his work is one with which I have no sympathy whatsoever: according to Castelo ‘Pentecostalism on a number of scores is decisively not a Protestant tradition generally and not part of an amalgam known as evangelicalism particularly’ (p.xiii). Contrary to Castelo, I would argue that a Pentecostalism which ceases to be Protestant and Evangelical thereby ceases to be truly Pentecostal. And yet, despite such fundamental differences, I very much enjoyed Castelo’s work, and I’m sure I’ll interact with it a lot in the years to come. Despite our presuppositional differences, one of the things which helped me profit from Castelo’s work was his drawing out what he saw as the points of contention between Evangelicalism and Pentecostalism. As he states in his limitations, it is impossible to give a global view of the evangelical movement, and so he works with the views expressed in certain forms of North American evangelicalism. So, yes, I can readily admit that Pentecostalism is not the Evangelicalism of Carl F.H. Henry. But then again, I’m not sure any form of British or European Evangelicalism (not to mention the largest swathes of contemporary North American Pentecostalism) would fit into Henry’s mould. So, Castelo’s distancing of Pentecostalism from Evangelicalism might make some sense when working with very limited definitions of both Evangelicalism and Pentecostalism (but not when one takes a wider view). In fact, it might be in taking a wider view of Evangelicalism that a case for a mystical aspect to Pentecostalism could be strengthened (and rescued from a great deal of the ‘significant resistance’ which Castelo expects). Castelo at several points recognises that Pentecostals themselves are largely unfamiliar with the writings of the mystics and uncomfortable with the language of mysticism. Yet, there is another tradition with its own mystical piety with which British Pentecostals have historically found a great deal of affinity, and whose writings are familiar to (at least all but the most recent generation of) British Pentecostals. What tradition is that? Puritanism! 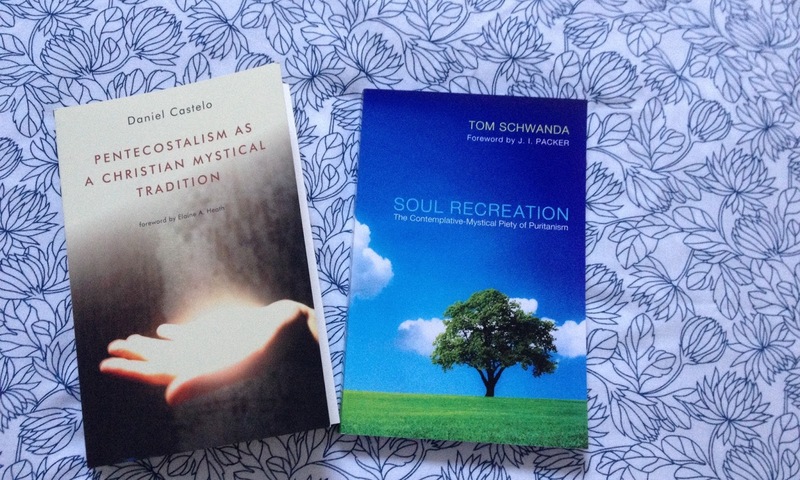 Tom Schwanda’s book, Soul Recreation: The Contemplative-Mystical Piety of Puritanism (Eugene, Oregon: Pickwick, 2012) provides an academic consideration of the mystical piety of Isaac Ambrose, a Lancashire Puritan of the 17th century. And, in doing so, could perhaps form a useful conversation partner for the conversation about Pentecostals and mystical piety which Castelo wants to open. For in Schwanda’s work (and in Isaac Ambrose’s life and thought) we have an example of a mystical piety which both demonstrates significant parallels with early Pentecostalism, and is at the same time firmly rooted in a Protestant Evangelical identity. While Castelo critiques Evangelicals for their logocentrism and sees a Pentecostal mysticism as a pneumatic corrective, Schwanda (and Ambrose) provides an alternative, evangelical mystical piety, firmly rooted in Scripture and in the Christ of the Scriptures, and there seeing the work of the Spirit. Schwanda uses Ambrose’s example to demonstrate that Evangelicals do not need to run to other traditions to find a contemplative-mystical piety, but rather, can draw on the resources which already exist in their own tradition. ‘Therefore, the challenge is to recover the lost heritage of piety within [Reformed/Evangelical] theology that itself is certainly not exclusive of patristic and even medieval piety’ (p.245). The similarity of Ambrose’s experience to early Pentecostal testimonies is uncanny. And given both the Puritan pedigree (unlike in the United States, British Pentecostalism did not have a Wesleyan background, and most significant early Pentecostal leaders came originally from denominations which traced their roots to the Great Ejection of 1662 and thus Puritanism) and Puritan affinities of British Pentecostalism, this similarity wouldn’t appear to be a mere coincidence. These are kindred traditions, separated by nearly 300 years, but describing very similar experiences in very similar ways. Yet, Schwanda identifies Ambrose’s experience as a mystical one, demonstrating ‘a contemplative-mystical piety that is every much as rich as that of Western and Roman Catholic devotional writers’ (p.180), drawing a comparison with Teresa of Avila, Bernard of Clairvaux, and Jan Ruusbroec. Castelo argues for Pentecostalism as a mystical tradition. Schwanda demonstrates that, historically, a mystical piety can be firmly rooted in an evangelical Protestant theology. And furthermore, that particular strand of evangelical Protestantism is one out of which (British) Pentecostalism flowed and with which Pentecostalism has many affinities. Therefore, it is not necessary, as Castelo would have it, to jettison Pentecostalism’s Protestant Evangelical moorings to see a mystical element within Pentecostal life and thought. Rather a mystical piety can flourish, and indeed by fostered, within an Evangelical theology and with a strong Evangelical attachment to Scriptural authority. For those of you who read academic theology books, I highly recommend Castelo and Schwanda’s monographs. And for those of you who don’t, I’ve heard that there should be a more popular-level introduction to Isaac Ambrose and his piety written by Tom Schwanda coming soon (to which I am very much looking forward!). And of course, in the meantime, there’s always Isaac Ambrose’s magnum opus, Looking Unto Jesus, to give you plenty to read!